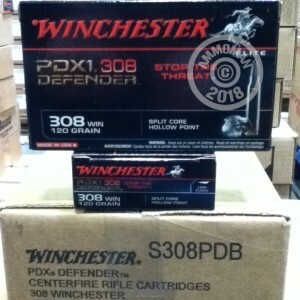 Order Today, 20 Rounds of .308 Winchester Supreme Elite PDX1 120 Grain JHP Ammo at AmmoMan.com. This bonded core .308 Winchester ammunition is a fast-moving, hard-hitting load designed to deliver reliable expansion after punching through barriers or thick animal hides at long range. Each cartridge in this box of 20 fires a light 120 grain split core jacketed hollow point at about 2,850 feet per second. Winchester ammunition is manufactured in Oxford, MS using non-corrosive Boxer primers. Premium ammunition such as Supreme Elite PDX1 comes with nickel-plated brass cases for increased durability. AmmoMan.com is your one stop shop for ammunition. With free shipping for all orders over $99, we can cover all your shooting needs at a price you can afford.